How Far is Stone Bridge Spring Meadows? A private boutique living space that's far away from the maddening chaos of the city. We believe in building around nature. A place where fresh air abundant water and blissful silence of the country side invite you to a life of comfort. Reinforced cement concrete (RCC) framed structure with columns and beams, Hollow/ Solid Block paneled walls, plastered and painted. Bedroom doors with padak wood frames and flush doors with enamel paint. Windows with glass doors and steel grills with enamel print. Branded vitrified tiles of 2x2 in living, dining bedrooms and kitchen. Anti skid flooring tiles and matching colored ceramic tiles up to 7 feet height on the wall for all toilets. Black granite slab platform with stainless steel sink and glazed tiles upto 2 feet height above the platform for all kitchen. Hind ware or equivalent sanitary fittings. Metro or equivalent C.P fittings. 3 phased power supply with independent meters. Concealed wiring with ISI quality cables. Anchor or equipment branded switches. 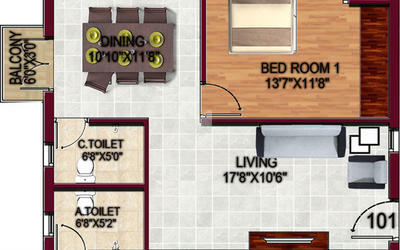 AC power point in al bedrooms and living room. Geyser point in all toilets. Telephone TV connectivity line in the living room and master bedroom. Walls coated with putty and good quality acrylic emulsion paint. External walls will be painted with weather proof exterior emulsion. 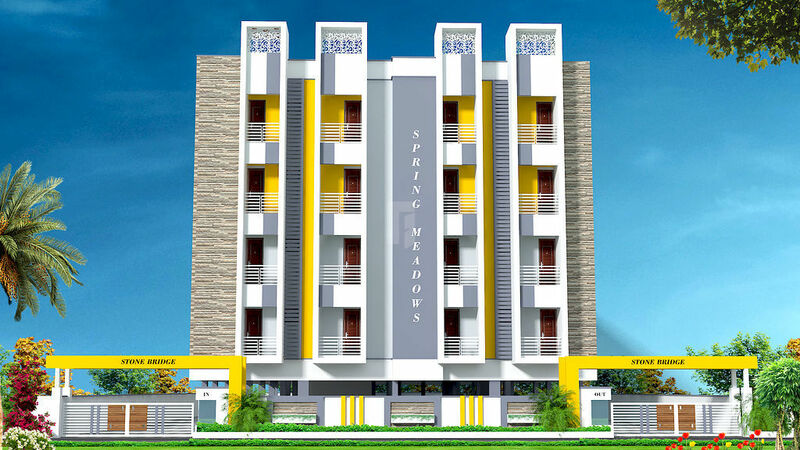 Stone Bridge Promoters was incorporated in 2008 and it is a well-known construction company which has been fulfilling the dreams and aspirations of home buyers in Chennai. The company has successfully completed 10 projects so far since 2008. Their dedication and hard work have earned them a very strong and reputed name in the industry. Stone Bridge Promoters developments include Stone Bridge Rainbow Paradise located in Velachery which offers you ready to occupy 1BHK, 2BHK & 3BHK for sale in Velachery and also an upcoming project Stone Bridge Spring Meadows in Padappai which offers 2BHK & 3BHK for sale in Padappai as well as Stone Bridge Pearl Castle in Padappai which offers you 2BHK apartments for sale in Chennai. The group is strongly committed to providing excellence in whatever it does. They have always strived to give the best to its customers through excellence and quality service. Stone Bridge Promoters complies with the age-old traditions of Vastu, combining them with new age architectural innovations. So if you are a home seeker who has has a preference of having a home which is Vastu compliant and equally modern, Stone Bridge Promoters have just the for you.